High in a church balcony last weekend, waiting to perform a solo for Palm Sunday and trying not to panic, I thought about cars being hit with hammers. I'm not sure this is the kind of visualization recommended for singers. But sometimes genetics asserts itself. A college biology professor once told my class that genetic mutation is like whacking a car with a hammer. You will almost never improve your car this way. More often, you'll damage it. If you're lucky the damage will be only superficial: a change in the silent portion of your genome, or maybe a few funny feathers. The piece my choir was getting ready to sing, Gregorio Allegri's Miserere, has experienced some mutations in its own DNA over the centuries. Allegri composed the piece way back in the early 1600s, and after that it was sung exclusively during Holy Week at the Sistine Chapel. Even though people had to attend a 3 AM service in Rome to hear it, the Miserere became famous. The Vatican, wanting to keep the piece to itself, threatened excommunication for anyone who copied down the score. As secrets and life forms tend to do, though, the music leaked out. In the late 18th century, a certain precocious teenager with the last name of Mozart spent Holy Week in Rome with his father. After hearing the Miserere at the Sistine Chapel, young Wolfgang sat down and transcribed the whole thing from memory. He returned for a second performance to double-check his work. From there, the score got into the hands of a music historian who published it. If the music had really been genetic material, Mozart would have been DNA polymerase, a molecular machine that copies DNA. The polymerase molecule grasps a DNA strand and crawls along, letter by letter, building a matching strand as it goes. Even if DNA polymerase is performing well, damage to the genome can come from outside sources such as UV radiation. But a large fraction of your DNA seems to do nothing at all. If a mutation happens here, you won't know the difference. If a slip-up creates a synonymous change in a gene—the code allows for some words to be spelled in multiple ways—you'll also be fine. And if the mutation does something horrible, it will remove you from the gene pool. Evolution doesn't care much about any of this. It only notices the rare constructive strokes of the hammer, and it only sees them if they happen in the cells that will become your sperm and eggs (called the "germ line"). If you have DNA damage in the skin of your back from too much tanning, you can't pass it on to your children. Back when Allegri's Miserere was being sung in the Sistine Chapel, the choirs were made up of men and boys. In choirs like mine, women sing the alto and soprano parts. But that's only a superficial mutation; we singers are the flesh of the piece. Natural selection didn't weed out this mutation. Once the change had happened and been passed to new generations of the musical score, it stayed in place—even after the error was discovered. We continue to sing the mutated piece because, simply, it's awesome this way. Here's a video. You'll know when the boy soprano hits the high C: it's the note you hear through the bones of your spine instead of your ears. It's not an overstatement to say that what happened to Allegri's music represents the whole history of life on Earth. Every new development has come from a mistake, small or egregious, that was allowed to stick around for one reason or another. Life started as tiny blobs, then whoops—heads! Legs! Oops again—tulips! 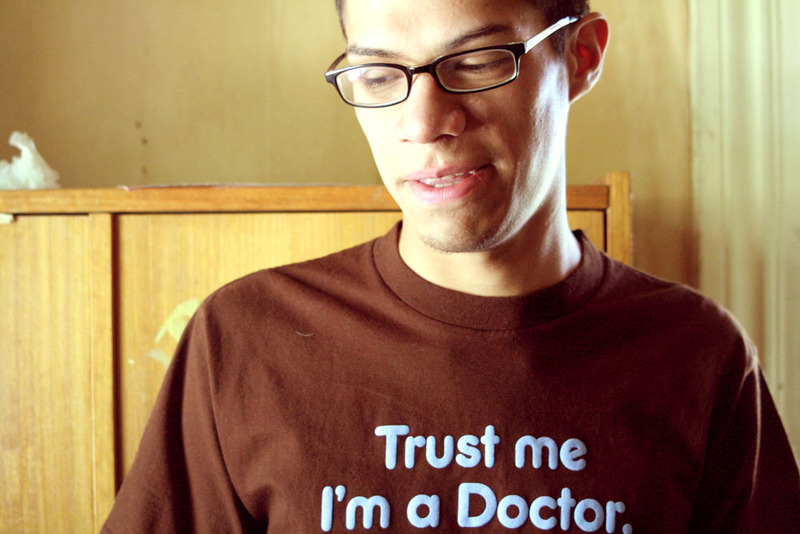 Uncorrected errors became tree bark, snail shells, lungs, fur, resistance to antibiotics. Inching along mistake by mistake, life forms developed the machinery to make blood, slime, deadly venom, and spider silk. Some living things have come together so elegantly that they bring an audience to its feet. There are racing cheetahs, swooping owls, orchids that mimic bees. But even the giant, gut-colored flower that stinks like a corpse to attract flies is a success in its family line. The cassowary is a bird that made so many mistakes, it traded the ability to fly for tree-trunk legs and a head with a sail on top. 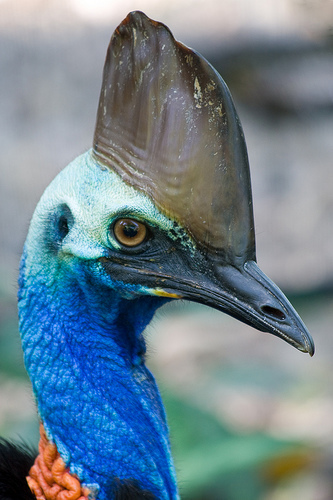 Even the cassowary, though, is doing something right. Errors become the high notes. Postscript: My choir director turns out to have a son who, at age three, actually took a hammer to the family car while it was in the garage. The car was not improved. 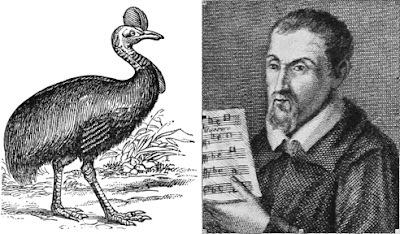 Images: Top, cassowary from The New Student's Reference Work and Gregorio Allegri, both via Wikimedia Commons. Bottom, cassowary by Peter Nijenhuis via Flickr. *Plot clarification, in case anybody is worrying about me up there in the loft: this is not the part I sang.